Your brand is thriving, awareness is increasing, so you’re just going to keep doing what you’re doing, right? Wrong. There are always new opportunities knocking at your door to help your business grow even more. Technology is on our side and it’s easier than ever to reward your brand with a little extra exposure and profit. Most of today’s consumers base purchasing decisions on relatable, emotional connections with a brand. This means your brand needs something extra, something that will help you stand out amongst your competitors. Believe it or not, that something extra, is branded merchandise. People love to feel connected to brands. They want to represent them, they want to talk about them, they want to post about them. All of which, are free marketing, so it’s important to offer something to help their representation of your business stand out. This is where merchandising comes in. Thousands of dollars are spent each year on paid ads, commercials, signage, etc., all for a little exposure. Meanwhile, every time a sale is made in your merch shop, that’s one free walking billboard for your brand. You’re essentially getting paid for someone else marketing your business. Many people fret at the thought of merchandising. Things like overseas, buying inventory, packing and shipping all come to mind. That may have been the case years ago, but not anymore. The merchandising industry has completely evolved into a hassle-free place for anyone to grow or start a business without any overhead. How is this possible? With the power of print on demand merchandise. Print on demand is basically merchandise made to order. You don’t have to buy t-shirts and sweatshirts in bulk, get them printed and hope all of them sell. Inventory is pre-purchased and warehoused, so orders are printed as they come in. So, all you’ll have to do is collect your commission! 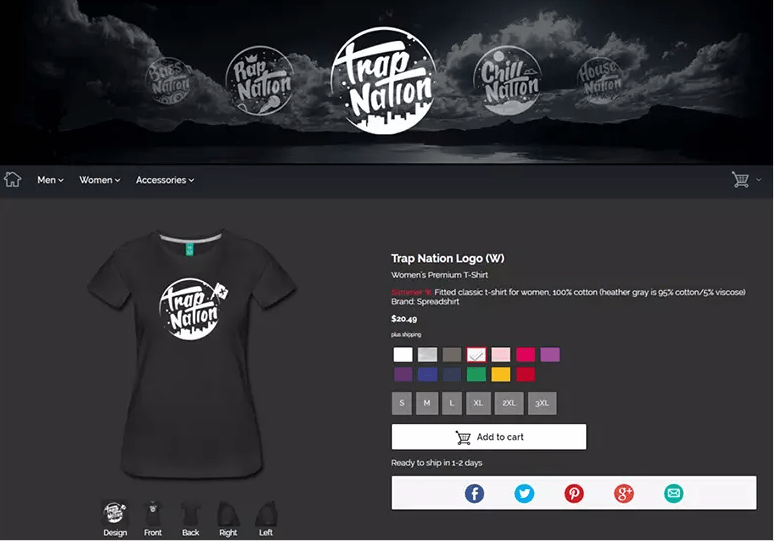 There are so many print on demand platforms available online, but an online shop system such as Spreadshop helps create a unique brand and a standard. If you sell merchandise online with Spreadshop, you’ll never have to spend or invest a single cent. You’re probably thinking, “Hmm what’s the catch?” Truth is, there is no catch. You can literally create and sell branded merchandise in your own online shop 100% free. The Spreadshop system was built around the needs of go-getters and entrepreneurs. Whether you already have a strong brand or you’re building one from the ground up, you’re not going to have time for packing and sending merchandise orders. That’s why Spreadshop takes care of production, fulfillment and shipping at no cost to you. They saw the gaps within the merchandising industry and filled those gaps by simplifying the lives of business-owners. So, if you’re thinking about buying t-shirts in bulk, think again. It’s the twenty-first century, print on demand merchandise is a hassle-free and easy way to engage your fans!